Love Christmas? Hate Christmas? Sound Off About Christmas Here! For many, it's their favorite time of the year: the gifts, the food, the music, the spirit of the season. What do you love most about Christmastime? 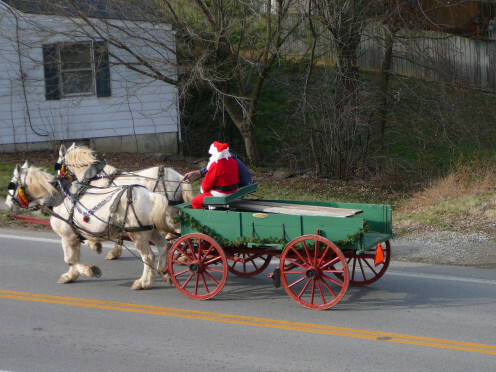 What are your favorite Christmas traditions, and how do you feel about various aspects of the holiday? Here's your chance to have a little fun and share your opinions on all aspects of the holiday: what you love, what you perhaps hate, what you might wish is different for Christmas in the future. Most questions are simple multiple choices, although there are a few debates you can join and places to expand on your opinions as well. There are 50 questions in all - for now, although I may add additional questions in the future. So jump in and see how your opinions about Christmas match up with those of everyone else! 1. Do You Celebrate Christmas? - The Most Basic Christmas Question of All! Of course, let's start with the basics. Is Christmas a holiday that is celebrated and marked by you and your family, or not? (Obviously if it isn't, most of the rest of this survey won't apply to you! No, I do not celebrate Christmas. I celebrate a different winter holiday. No, I do not celebrate Christmas nor any other winter holiday. Absolutely! Christmas is the best. 3. Christmas vs. Halloween - Which Holiday Do You Love More? Probably the second most popular holiday next to Christmas is Halloween - and it is a holiday some people love even more, for various reasons. But what do you think? Is the "Spooky Season" better than "Tis the Season"? Would you rather carve Jack-o-lanterns than decorate a Christmas tree? Join the debate here! Which holiday is better: Christmas or Halloween? 4. What Is Your Favorte Thing About Christmas? - The Gifts, The Food, The Spirit...What Means the Most To You? Celebrating the birth of Jesus Christ and marking the religious aspects of the holiday. All the Christmas lights and decorations. The food and special holiday meals and treats. I love it all - the entire atmosphere of the Christmas season. 5. Christmas Music - How Do You Feel About Christmas Music? Every winter, it seems the radio stations are taken over with Christmas music. It's everywhere you go. Do you love it, hate it, or think it's just okay? I love Christmas music and could listen to it all the time. I enjoy Christmas music well enough during the season. I think some Christmas music is okay, but I get tired of it by the time Christmas finally arrives. I don't really like Christmas music that much. Popular singer Michael Buble will treat fans this season with his renditions of Christmas classics, as well as a new original song, "Cold December Night". This release is TobyMac's first Christmas album in 10 years and should be a truly exciting one. Blendig rock, pop, hip-hop and soul in his uniquely diverse sound, this will definitely be an album you'll be hearing a lot of this season. 6. Christmas Caroling - Do You Enjoy This Christmas Tradition? Every year - I love it! I've done it sometimes and enjoyed it. I've done it a couple times and didn't really enjoy it. I've never done it but I'd like to some day. I hate Christmas caroling. I won't do it and I don't like when carolers show up at my house, either. 7. Christmas Eve Traditions - Twas the Night Before Christmas...and what are YOU likely to be doing? How do you typically spend your Christmas Eve? Cooking and cleaning house before the relatives descend. Wrapping presents, decorating, or otherwise doing last-minute Christmas preparations. Travelling to get to family/elsewhere in time for Christmas day. Enjoying the Feast of the Seven Fishes, or another elaborate traditional meal. Shopping for gifts until the very last moment! Working retail until the very last moment! Partying and having fun with friends. 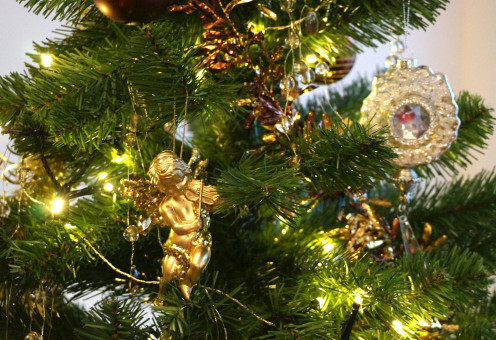 Does your Christmas celebrations involve religious traditions and observances? Do you go to church on Christmas or Christmas Eve (Midnight Mass)? 9. 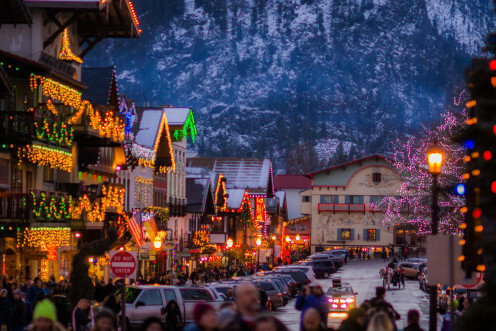 Travel for Christmas - Would You Ever Get Away From It All for Christmas? Do you always spend Christmas at home with family, or have you ever traveled somewhere far from home for the holidays? Never and I wouldn't in the future. Christmas should be spent at home with family. I never have before but I'd consider it. It could be fun and a nice change of pace. I've taken a vacation trip somewhere for Christmas before and enjoyed it! I've taken a vacation trip for Christmas but didn't enjoy it, would rather have been at home. Every year, without fail. It's a nightmare. Sometimes, but not every year. Very rarely. We normally get along well every Christmas. Never. We are the picture of a perfect happy family on Christmas! 11. Santa Claus - Is Santa Claus Coming to Your House This Christmas? 12. Christmas Cards - You've Got (Christmas) Mail! Sometimes - when I have the time and money for all those cards and stamps! I send electronic cards or email messages instead. I'll send a few cards to very close friends and family, but that's all. No, I don't bother with Christmas cards. The shopping crowds and craziness with having to buy so many gifts for people. The general over-commercialization of Christmas today. Gaining weight from eating too many Christmas cookies and other treats. Having to work retail during the Christmas season. Too much Christmas music on the radio. Have you ever had to work on Christmas Day? No, never. And I would refuse to do so. Never before, but I would in the future if the pay was right or I was needed. I have, and it stinks. I have, but I didn't mind doing so. I always have to work on Christmas. 15. Solitary Christmas - Does It Make for a Blue Christmas? Have you ever had to spend Christmas alone? No, never. I've always been with friends or family. Yes, and it was terrible! Yes, but I didn't really mind/I chose to be alone. 17. What Is Your Traditional Christmas Dinner? - What Will Be On Your Table? We do something different every year for Christmas dinner. I make some but not a lot. Mostly for my own family's enjoyment. Sometimes I do, some years I don't. I don't, but I sure do enjoy eating them when other people make them! I hate Christms cookies! I gain ten pounds just looking at them! Christmas Cookies and Treats - Recipes and Cookbooks to Bring You Inspiration! An abomination and crime against humanity. Good as gifts for people you really don't like. Actually quite tasty if made properly. It's a shame they have such a bad reputation. There is no such thing as a bad fruitcake. How can you hate fruit, sugar and booze? I've never tasted it so I don't know. 21. How Much of the Christmas Dinner Meal Do You Prepare? - Are You Head Chef of Just a Happy Guest at the Christmas Table? Christmas dinner: How involved are you in its preparation? I do it all myself. I'm usually cooking a week or more in advance for it! I head up the Christmas meal but have some help from family and others. I usually bring a dish or two to the table. I might help a little bit, like chopping vegetables or opening a can of cranberry sauce. I'll help with clean-up but I don't cook. Help? What's that? You don't want me near a kitchen. I'm just here to eat. We cater/eat out for Christmas. What is your favorite special Christmas treat or food to enjoy? 23. Christmas Wish Lists - Do You Make a Wish List? How do you feel about Christmas Wish Lists? I love them. I make one every year and try to fulfill other's wishes when I can. I don't make a wish list for myself but find them useful for shopping for others. I sometimes make a wish list but not every year. I don't like Christmas wish lists and don't make any myself. 24. Christmas Shopping - When Do You Shop for Gifts? At Christmas craft fairs and bazaars. I don't shop for gifts - I try to make my own. I don't do Christmas gifts, period. 25. Best Christmas Presents - Which Gifts Mean the Most to Receive - Or Give? What do you think makes for the best Christmas presents? Something really expensive and extravagant. Anything off of my Christmas wishlist, expensive or not. Cash or a gift card. Something personal and specifically made for a person, like a scrapbook or perhaps an invitation to a homemade dinner. Yes, I go shopping every Black Friday for my Christmas presents. I go shopping on Black Friday, but not necessarily for Christmas presents. No, I shop elsewhere/other times for Christmas presents. No, I support Buy Nothing Day and actively avoid shopping on the day after Thanksgiving. 27. Gift Cards for Christmas - Love Gift Cards or Hate Gift Cards? Awesome. I can buy whatever I want with them - or just pay off my own Christmas bills. Sometimes good, but only when for a store or restaurant I really like and would shop at otherwise. I'd rather just have cash or a check if someone wants to give me money for Christmas. Impersonal and cold. I feel it means the giver doesn't care or know me well enough to know what I'd like for a gift. 28. Returning Christmas Gifts - How Do You Feel About It? Do you return Christmas gifts that aren't right for you? Absolutely - especially if it's something simple like needind a different size in a piece of clothing, or it's a duplicate gift. Sometimes. I do tend to feel a little uncomfortable about it. I'll try to re-gift or donate something unwanted or not useful to me, not exchange it. Never. If it's a gift, I'll keep it - even if it's an ugly sweater I'll never wear in my life! 29. Is Christmas Too Commercial? - Has The True Meaning of Christmas Been Lost? Has Christmas become over-commercialized in society today? 30. The Cost of Christmas - Will You Be Paying Off Christmas Until July? How much money do you end up spending on the Christmas season? Nothing. I don't decorate, buy gifts, cook special meals, or otherwise spend on Christmas. Less than $100. I try to be very frugal during the holidays, or I just can't afford more than that. Less than $500. I'm careful with my spending but still have to buy a certain amount for the holidays. Less than $1000. With a lot of gifts to buy and food to prepare, it's just impossible for me to spend less. More than $1000. I know I spend a lot on the holidays. I'm afraid to even count or figure out how much I spend on Christmas! 31. 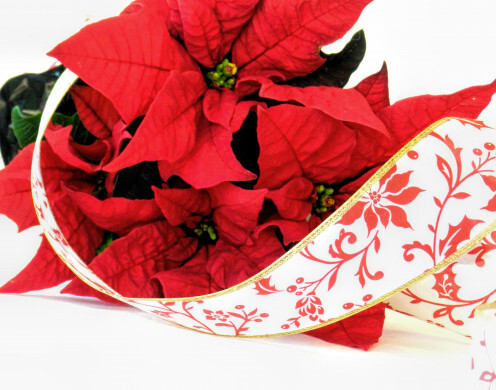 Holiday Shoping for Decorations, Gift Wrap... - When Do You Purchase These Christmas Necessities? 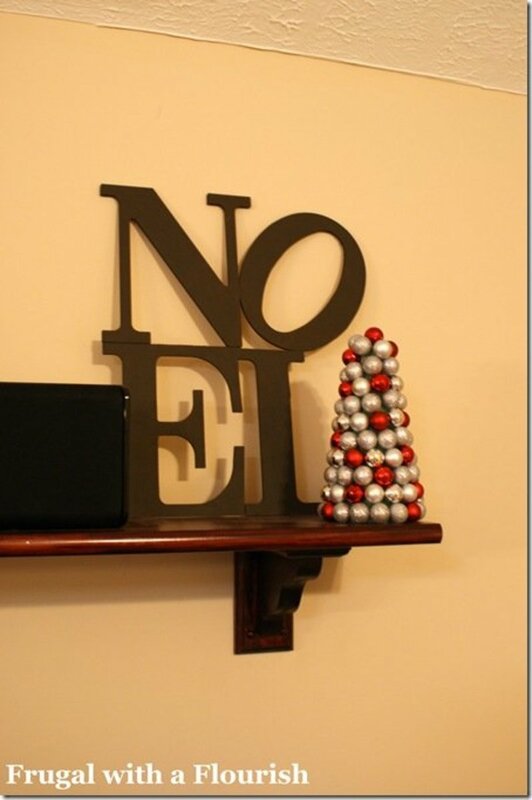 When do you shop for Christmas items like new decorations, lights, gift wrap, Christmas cards? As soon as they hit the shelves, every season. I like seeing what's new and getting it as soon as possible. Sometime during the month of December, after shopping around for a while. At the very last minute, on Christmas Eve. The day/week after Christmas! I am a bargain hunter. Do you decorate a Christmas Tree every year? Yes! In fact I have more than one Christmas Tree in my house, every year. Yes. I do a Christmas Tree, but just one. I sometimes have a Christmas Tree, but not always. No, I don't decorate a Christmas Tree for my house. For some, a Christmas tree is not a Christmas tree unless it is real and alive. Others prefer fake plastic trees - less mess, more consistency, or perhaps even required in some living spaces. But what do you think - is fake or real better? Make your choice and explain why below! 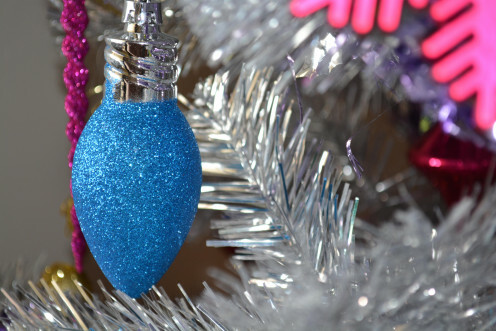 Which do you prefer: live or artificial Christmas trees? Thematic. I go for a specific color scheme or theme for my tree. Ecclectic. Whatever decorations I have on-hand are what end up on my tree. Historic. I like old-fashioned, handmade ornaments, garlands and bows. A family story in progress. I collect ornaments through the years to reflect my family's growth and landmarks. 35. Christmas Tree Set-Up - When Do You Put Up Your Tree? When do you set up your Christmas Tree? Before Thanksgiving. I like to get an early start. The day after Christmas - I'm a real bargain hunter! 36. Christmas Tree Take Down - When Do You Pack Up Your Tree - Or Put It In the Trash? When do you throw out or put away your Christmas Tree? The week after New Year's. Mine stays up year round! 37. 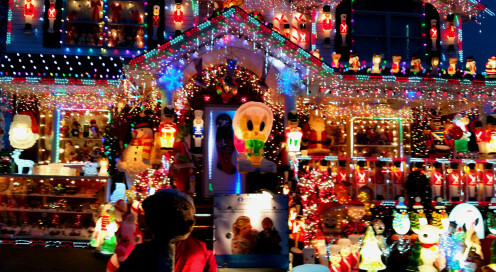 Outdoor Christmas Decorations - Do You Light Up Your Neighborhood? 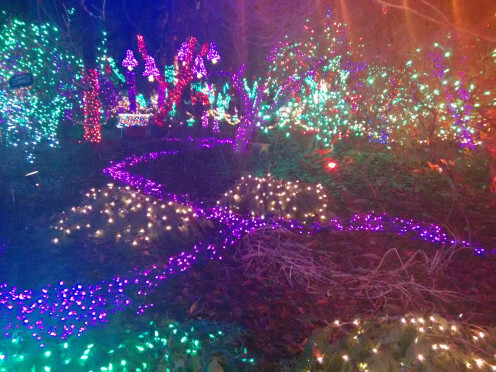 Do you set up outdoor Christmas lights and decorations? Yes! I go wild and really light up my entire house and front lawn. I do some tasteful, simple outdoor decorations, but not too much. I would decorate but I live in a city/apartment/condo building where I can't. I sometimes decorate outdoors, but not always. I don't decorate outdoors, whether I could or not. 38. Christmas Nativities - Is a Nativity Scene Part of Your Christmas Decorations? Do you set up a Christmas Nativity in your home? 39. Christmas Television - What Do You Watch On Christmas? Alternative programming - anything OTHER than Christmas-related programming. I do not watch television on Christmas Day. 40. Christmas Movies - Old Classics and New Favorites - Which Is Yours? 41. "It's A Wonderful Life" - How Many Times Have You Watched This Christmas Classic? How many times have you seen the movie, It's A Wonderful Life? I watch it every year and have lost count! Which is your favorite animated Christmas story from Rankin/Bass? Wow, you must really love Christmas if you made it this far through my survey! Thanks for adding your opinions - and if you've got anything left to say about Christmas, feel free to do so here! 43. Any Final Christmas Comments? - Leave Them Here in My Guestbook!